News of the tragic avalanche on Siachen which buried ten Indian soldiers reminded me of the glacier’s place in the Guinness Book of World Records. As a schoolboy, I had large sections of the British edition of that book committed to memory. It was no deliberate effort but the automatic result of being fascinated enough by the information it contained to read through it repeatedly. I convinced my mother to buy me the American version as well, but found it preoccupied with things in which I had no interest, like the the National Football League. The British edition was more substantial and less parochial. I recognised early on that Indians held very few world records. The great swimmer Mihir Sen found mention, as did the invincible hockey teams of undivided India. Predictably, the longest recorded legal dispute had taken place in India. Then there was a man boasting the world’s longest moustache, and Shridhar Chillal, who had the world’s longest fingernails. Kharagpur’s railway platform, over a kilometre long, was listed in a section on edifices and constructions. Years later, I took a train to Calcutta that stopped at Kharagpur. As the station approached I grew tensely excited, for the longest platform on the planet was to me the equivalent of a world heritage site. The train was late and the January night cold and misty. I got off onto the famous platform, walked as far as the engine, and stared into the distance. The shelf of concrete stretched further than I could see. Afraid the train would start rolling again, I returned to the seat and gawked through a window as we travelled the platform’s length. When I settled back, a question popped into my mind for the first time. Why on earth had they made a platform so much longer than the longest passenger train? I assumed there was a reason, but I’ve never been able to discover it. Kharagpur is no longer the Everest of train platforms, having been surpassed by Gorakhpur a few years ago. Gorakhpur’s residents celebrated news of their taking possession of a world record when its 1.3 km platform was inaugurated. In interviews, they said they were proud because the town would no longer be seen as a dead-end mofussil. No news reports mentioned why such a long platform was necessary, or even helpful. The Kharagpur experience made me realise that records could be meaningful or purposeless. The feats of Mihir Sen and our hockey team, achieved against strong competition in widely popular athletic disciplines, were meaningful, while the railway platform and Sridhar Chillal’s fingernails, (which had grown so long, they fused together rendering one hand unusable) struck me as falling in the latter category. After the Limca Book of Records began to be published, along with an accompanying television show, Indians developed an affinity for purposeless feats. Individuals specialised in doing things that nobody in their right mind would want to do, such as chewing light bulbs or staying in a cage full of snakes or cycling backwards. Since 1984, Siachen has held a place in the book of records as the world’s highest battlefield. It seems like a record that is obviously meaningful. Hundreds of lives have been lost on the glacier, tens of thousands of crores of rupees spent on maintaining troops there. Surely, we ought to be proud of the valour and determination of our soldiers, battling the elements as well as the enemy for decades. And yet, why are they there at all? In 1972, a Line of Control was established as part of the Simla Accord that followed the Bangladesh war. The map makers divided peaks and valleys carefully, till they reached a point where no human habitation could conceivably spring up. At that point they just made the general remark that the line of control would continue north. Indians assumed this meant due north, and Pakistan and the United States decided it meant continuing along the route as marked all the way to the Karakorum Pass, which meant going north-east rather than due north. To assert its own interpretation, Pakistan began permitting mountaineering expeditions into the zone. India responded by sending troops to occupy the barren wedge. The Indian action was justifiable in and off itself, but appears not to have been thought through. What were the troops supposed to do once up there? Apparently guard a place in perpetuity that nobody but extreme sports enthusiasts would ever want to visit, and which had no economic value. Soldiers have been posted there in rotation these past 32 years, living in misery, suffering hypothermia and frostbite, all for a wilderness of interest only to Doctor Strangeloves obsessed with strategic heights. As the globe has warmed and the glacier retreated, it has not made life on Siachen any more comfortable, for the change in degrees Celsius is marginal, but appears to have increased the land’s perilousness, and not just for Indians. Two years ago, an avalanche buried 129 Pakistani soldiers and 11 civilians in the Gayatri sector not far from the glacier. Each death makes the Siachen conflict more absurd to people like me. Those who consider Siachen profoundly meaningful, though, think very differently. To them, each death hallows that land further, obliging us to defend it with more soldiers and more resources, for anything less would be a betrayal of those who gave the last full measure of devotion on those icy mountains. For over three decades, the assertive nationalists have has won the popular vote, and India has remained more interested in celebrating martyrdom than in reducing the need for sacrifice. It will be a long while before Siachen is returned to those who had sole possession of it for millennia, the snow leopards and ibexes. While the EU and the US have turned a blind eye to the Turkish government’s brutal clampdown in Kurdish regions, Turkish academics who have spoken out about the regime’s increasingly dictatorial policies have faced punishment and even imprisonment. Following this, Turkish federal prosecutors have investigated 1,128 of the signatories with33 academics from three Turkish universities in Bolu, Kocaeli and Bursa being detained because of their alleged propaganda for a terrorist organisation and insulting the Turkish nation, state, government and institutions. Turkey’s top higher education body, the Higher Education Board (YÖK), has called for university administrators to impose disciplinary sanctions against the academics. Subsequently, 109 academics from 42 Turkish universities were subjected to dismissal, discharge, suspension, termination and forced resignation. A government-backed counter-petition, Academics Against Terror, has also been organised. The Grey Wolves, also known as Idealist Hearts, a formal youth organisation of the Nationalist Movement Party (MHP) in the Turkish parliament, has even marked the office doors of signatories and left written threats. Despite this, immediately after the government’s response, the number of academics participating in the campaign increased from 1,128 to 4,491. There has also been a public reaction against the government’s tactics. Within just two weeks, independent petition campaigns organised by a variety of civic and professional organisations have collected more than 60,000 signatories, and supporting statements have been released by 65 organisations that have millions of members across the country. The original petition has also created much-needed international solidarity with more than 60 international institutions, organisations, leading academics and politicians issuing messages of support and ten international petition campaigns being organised worldwide. The recent clampdown on academics characterises the scope of the new “counterterrorism” strategy of the Turkish state. This “new” doctrine is again promoting a military solution to the Kurdish question by concentrating state violence against the Kurds and supporters of Kurdish rights. After a period of fragile negotiations with the hope of ending the decades-long conflict, the new doctrine has emerged since the June 2015 Turkish general elections, when Erdoğan’s Justice and Development Party (AKP) failed to win a majority in parliament for a single-party government. The government introduced the strategy after the June elections in an attempt to win back the votes of Turkish nationalists in the MHP, a long standing ultra-nationalist political party, and the “borrowed votes” of Turkish dissidents who temporarily collaborated with the HDP, a pro-Kurdish and pro-minority political party. The Turkish state is also using the Syrian refugee crisis and military intervention against the so-called Islamic State to gain international support from the EU and the US. In line with the “new” doctrine, the ongoing ceasefire agreement and peace negotiations between the Turkish state and the PKK (Kurdistan Worker’s Party) were officially suspended in July, with a state of emergency and curfew declared in Kurdish territories by the AKP government. According to a report in Turkish by the Human Rights Association in Turkey, between June and November, 602 people (including 41 children) were killed, 1,300 people were injured, 1,004 people were jailed and 5,713 people were taken into custody during the military operations in Kurdish towns. There were also 134 people killed and 564 injured in two suicide bombings in Suruç and Ankara. This campaign seemed to pay off for the AKP, with a significant increase in support within the six-month period. The AKP won 49.50% in a second parliamentary election called on November 1 2015, returning their single party majority. It seems that Turkey’s “new” anti-Kurdish doctrine is a strategic, precautionary manoeuvre to maintain the popularity of Erdoğan’s regime. The government is aiming to avoid potential resistance, such as that experienced in the Gezi Park uprising in 2013, which unified a wide range of dissidents including leftists, Turkish nationalists, capitalists from the upper classes and religious groups. Through its anti-Kurd strategy, the government is simultaneously deepening localised political and social tensions in Kurdish regions and reunifying right-wing nationalist civil society and political organisations under the flag of Turkish chauvinism. In this light, the petition by Academicians for Peace is not only a revolt against the government’s Kurdish policy, but also a very effective swipe at the crucial point of the “new” strategy. It draws academics, students, intellectuals and other urban professionals together throughout the country, sending a wake-up call to the international public that Erdoğan’s new political and military strategy cannot be tolerated. 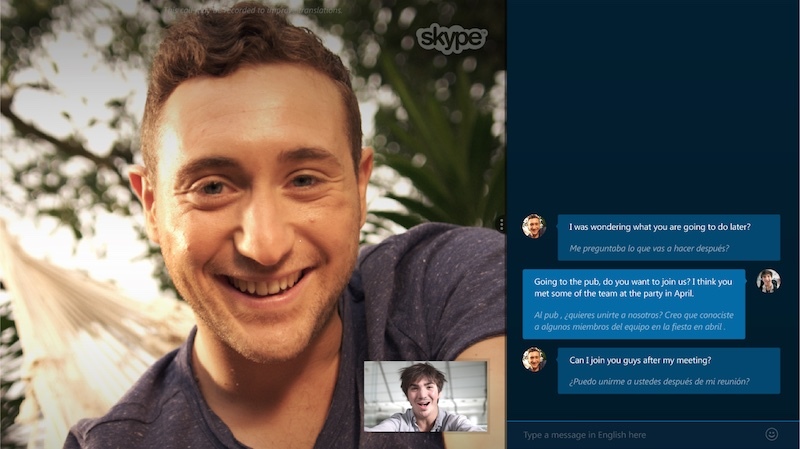 Popular video calling and instant messaging service Skype has announced that it has built the Skype Translator tool into its Windows desktop app for all users. The announcement comes a few months after Microsoft launched Skype Translator Preview for Windows, six months after rolling it out to general mobile users, and a year after the introduction of the preview on mobile . Microsoft announced in a blog post that the Windows app of the service offers voice-to-voice translation in seven languages: Chinese Mandarin, English, French, German, Italian, Portuguese, and Spanish. For users who prefer texting, the app supports 50 languages including Hindi and Urdu. 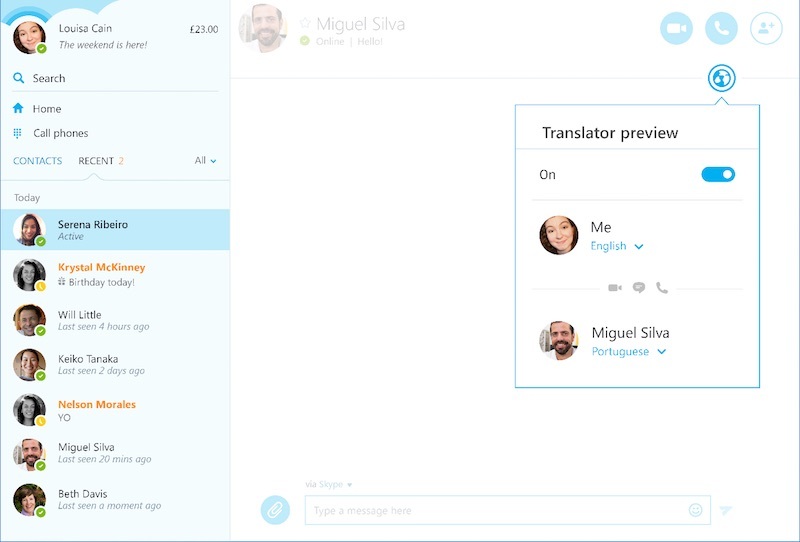 Launched in beta in late 2014, Microsoft announced in June last year that it would bring the real-time translation technology into Skype’s Windows client. The end goal is to break language barriers between people and have them succeed in communicating even if they don’t speak a common language. The feature uses machine learning. Microsoft said that over the testing period, the feature has gotten better as more people use it. The company noted that as of currently, French to English is the most popular language pair. It added that the number of calls per day has increased 400 percent since launch. The app supports Windows 8, Windows 8.1, and Windows 10. If you have the updated version of Skypefor Windows on your computer, you will now see a globe button in the top right-hand corner. The feature, sadly, is currently only available on the Windows app of Skype for now. The company added that is working on adding support for more languages and bring this technology to other platforms. Microsoft confirmed last month that it had delayed the release of Windows 10 Mobile, the latest version of its mobile operating system. And it seems the delay is finally over. The company has apparently started to seed the Windows 10 Mobile software upgrade in at least one region. 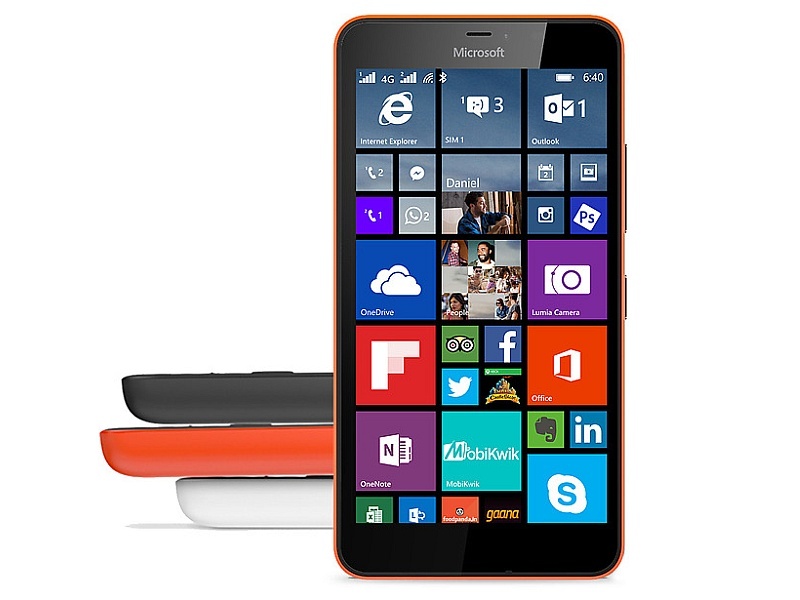 T-Mobile has confirmed (via WMPU) that it has begun to release Windows 10 Mobile for Lumia 640handset users in Poland. The build version that the company has released is 02177.00000.15184.36002. We realise that most of you don’t live in Poland, and/ or sport a Lumia 640, but the big news is that the software you’re anxiously waiting for has started to trickle out fromMicrosoft. Microsoft had previously committed to releasing Windows 10 Mobile to all eligible handsets in December. However, the company confirmed last month the time-frame had been extended to “early 2016.” As you may remember, all Windows 8.1-powered smartphone that have more than 4GB of internal storage are eligible to receive the free software update. Many smartphones that have launched in the past few months are already running Windows 10 Mobile. Some of these include the Lumia 950, the Lumia 950 XL, and the Lumia 550. To recall, Windows 10 Mobile offers a range of features including Continuum and Universal Windows Apps, and some enhancements to Message and Photos apps. According to media reports, Microsoft is working on an app that will allow Windows Phone handset owners to know whether their smartphone is eligible to receive the software upgrade. The app dubbed “Upgrade Advisor,” will also let users clear up storage space on the device to accommodate the new software upgrade.